Wednesday’s blizzard provided some much-needed quality baking time. Instead of going with a default cookie or brownie, I decided to see what else I had on hand and if I could branch out at all. I ended up making something I conjured up over a year ago and haven’t made since. The inspiration for this little number was a container of frozen peaches that has been living in my freezer going on five months now. Every summer, I refuse to accept that peach season will end, and I continue to buy them into September. Unfortunately, when I cut into them, reality strikes and I realize that sadly they are no longer good. Never one to throw food away, I slice them up and stick them in my freezer for use at a later date. I considered my options for baking with the peaches. I was really in the mood for scones, but all of the recipes I read called for heavy cream or sour cream or buttermilk, none of which I had. I had the standard butter, flour, sugar and eggs, and not much beyond that. I briefly considered muffins but decided they didn’t interest me. It was then that I remembered the last time I baked with my frozen peaches two falls ago. 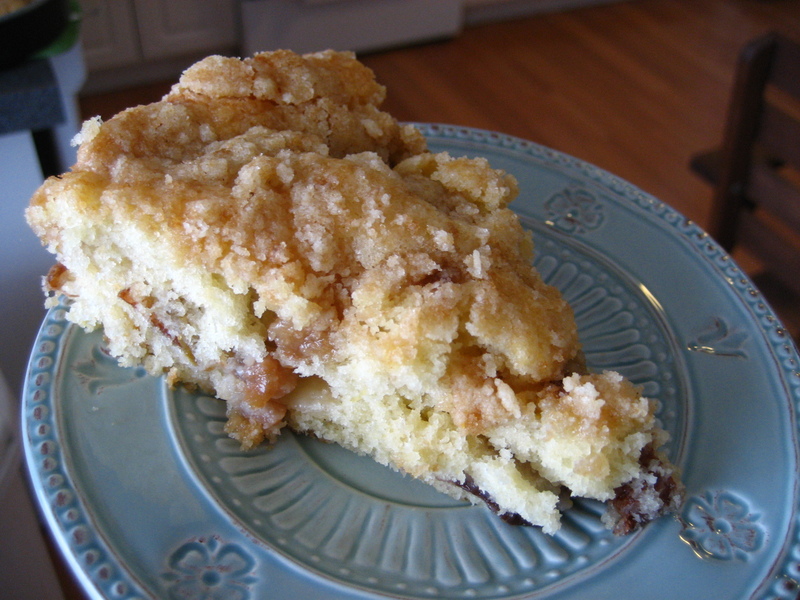 I put them into a streusel coffee cake. 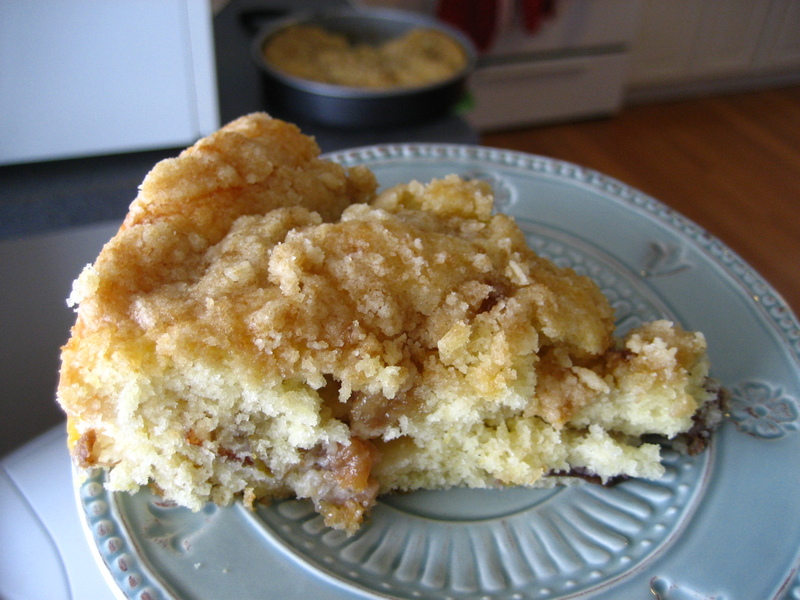 The peach and the buttery brown sugar topping were a match made in heaven. 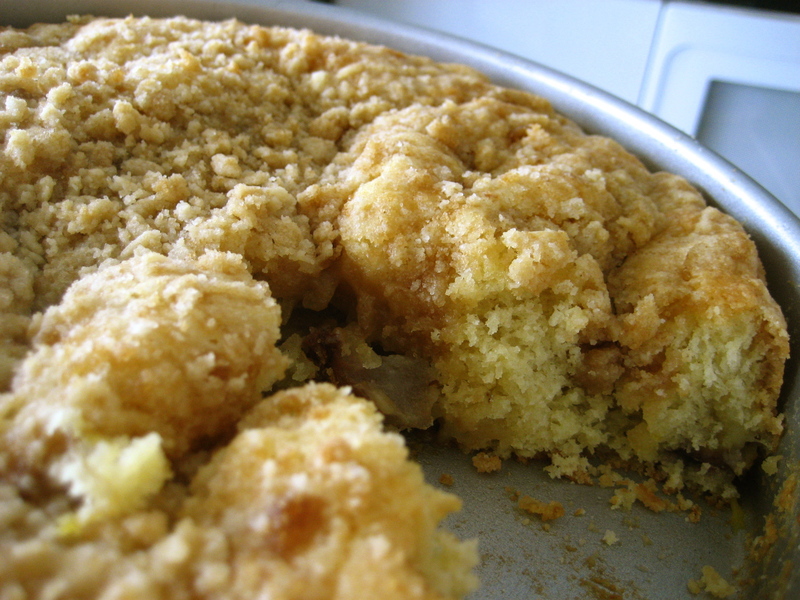 Luckily, coffee cake requires only the most basic ingredients and results in an impressive looking and scrumptious final product. I searched my recipe files hoping I had saved whatever recipe I used the first time, but in typical Elizabeth fashion, there was no recipe to be found. I googled and found this recipe which was very straightforward. I made a few tweaks, mostly just for kicks. She called for both vanilla extract and almond. While peach and almond is an appealing combination, I really wanted a sweet unadulterated vanilla flavor. She also calls for nuts in the crumb topping, which I omitted. I decreased the amount of crumb topping overall because while I do love crumb topping, I was looking for more of a light dusting than a solid layer. The cake itself is lovely, light and buttery. 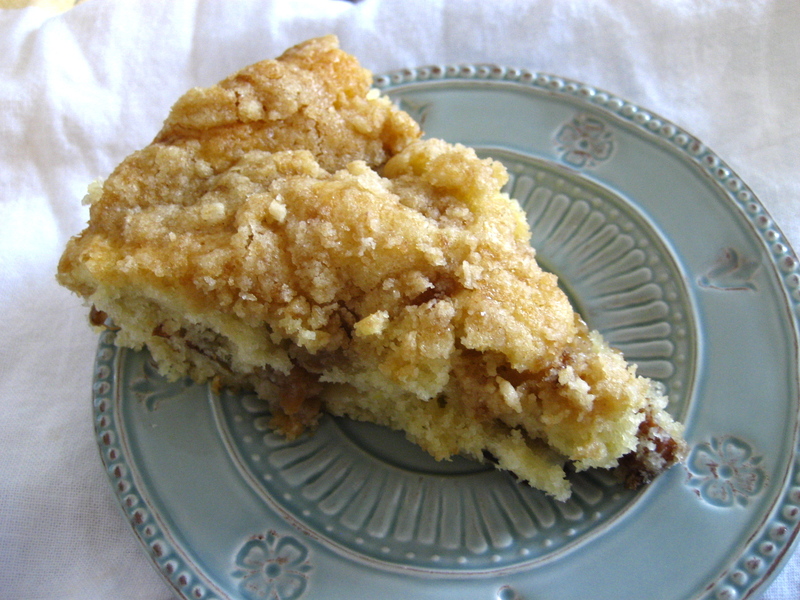 I actually want to try this recipe sans fruit and crumb topping the next time I need a simple white cake. I chopped the peaches fairly small, but I think I’d leave them bigger next time, possibly in eighths. Because I used a smaller amount of topping, it created more of a crispy, sugary crust in places rather than a toothsome layer of crumb. Every time you bite into a peach there is a wonderful juicy burst of summery flavor. On that cold blustery day when it seemed as if warm weather might never return, I was thankful I’d stashed those peaches in my freezer to bring back the tiniest bit of summer, if just for a day. Preheat oven to 350°. Grease a 9-inch round pan. To make the cake, in a bowl, stir together the flour, granulated sugar, baking powder and salt. In another bowl, using an electric mixer on medium speed or a wire whisk, beat the egg, melted butter, milk, and vanilla extract until creamy, about 1 minute. Add to the flour mixture and beat just until evenly moistened. There should be no lumps or dry spots. Do not overmix. Fold in chopped peaches. Spoon the batter into the prepared pan and spread evenly. Sprinkle evenly with the streusel. Bake until the topping is golden brown and a toothpick inserted into the center of the cake comes out clean, 35 minutes. Transfer the pan to a wire rack and let cool for 20 minutes. Serve the cake warm or at room temperature, cut into wedges. 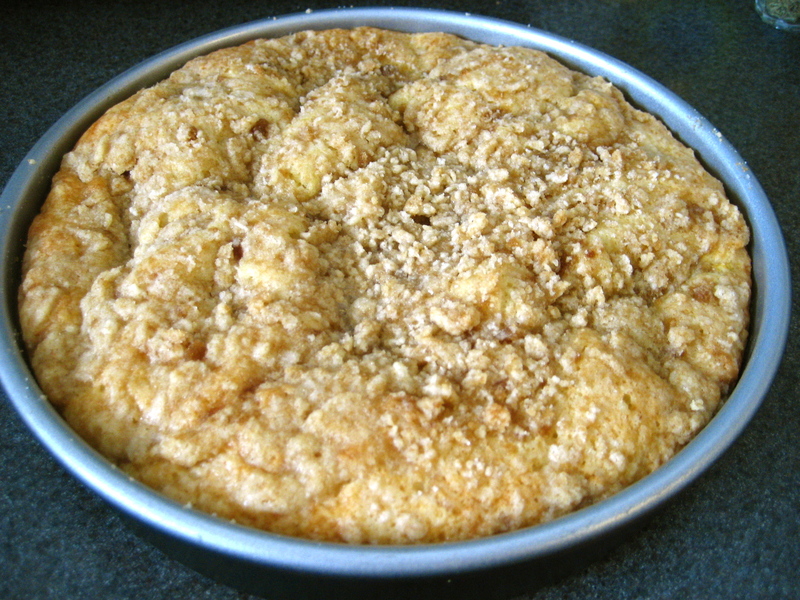 This entry was posted in Recipes and tagged baking, breakfast, Cake, coffee cake, dessert, peach, streusel. Bookmark the permalink. Oh man that looks delish! Nice plates too. Yum! We are seriously lacking in the breakfast foods dept, and I would like a slice of this now! This looks GORGEOUS! It looks like your snow day was a productive baking day! Yum. Looks great! I totally agree with you about freezing summer fruits for some uplifting baking on blizzardy days. I’ve found that Trader Joe’s frozen berries (or any brand, really) in a crumble during the wintertime always brings a dash of summer cheer. 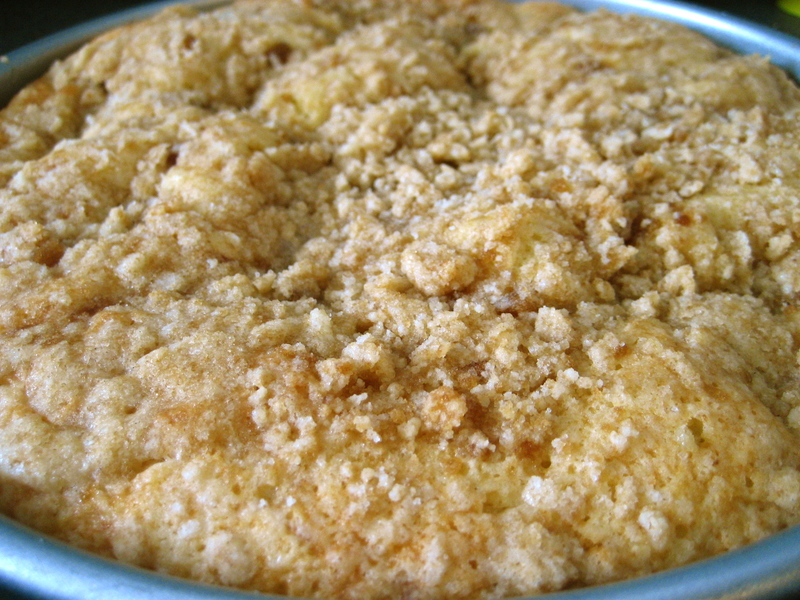 Light, buttery cake with peaches… I’m practically drooling. That sounds perfect! This looks so delicious! I love peach anything. Wonderful! MMMM that looks incredible. I love peaches! by far one of my favorite fruits! I made this today. It turned out great. This is the best new recipe that I have tried in a couple months. I did not use cinnamon because the king of the house hates cinnamon. I had to cook it for 40 minutes. It was still wet inside and wobbling slightly like a water balloon at 35 minutes. I did use fresh peaches. I was proud enough of this to give some to my neighbors. I hope it makes up for the horrible “cardamon cookies” I brought them that I made last week from some other blog. The lady on that blog bragged how great they were. I almost gagged on the amount of cardamon in them when I tasted one. I gave two to my neighbors anyway because I bring them all my experiments good or bad but I felt really ashamed. That woman who posted the recipe must have burned all her taste buds off in some horrific hairspray, propane leak, and scented candle accident or something. Thank you for a GOOD recipe on a blog for a change. P.S. My neighbors loved this. The man next door asked me if I had anymore. Yeah, buddy, dream on. I am eating the rest myself. Made this yesterday and really enjoyed it. Twenty-four hours later, only 1/4 of the cake remains. Thank you for the recipe!